In other news…I did something bright + healthy. I love smoothies for snacks. I need them loaded with protein and good-for-you stuff to make up for all the cookies and Lucky Charms and spoonfuls of cake batter that fill the rest of my day. 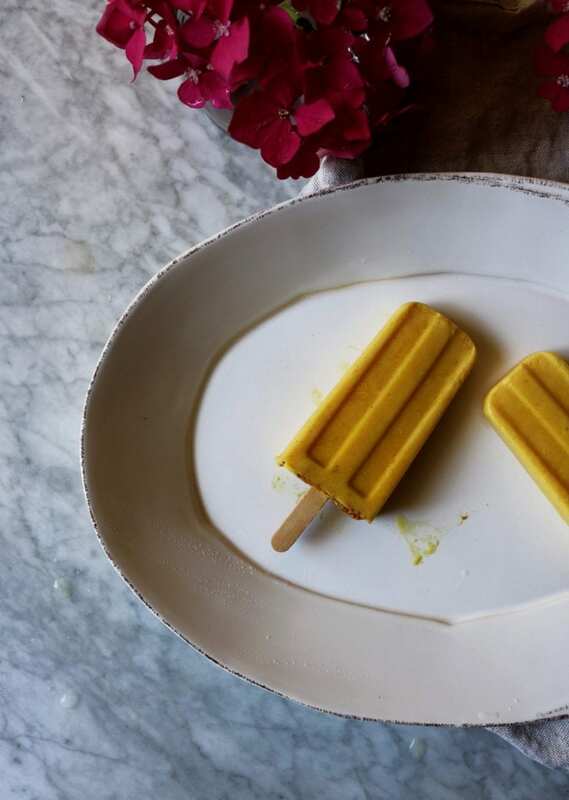 That’s why I made us Tropical Tangerine Turmeric popsicles, aka Pious Pops. They’re loaded with Greek yogurt, tangerines, collagen peptides, coconut and tropical vibes. 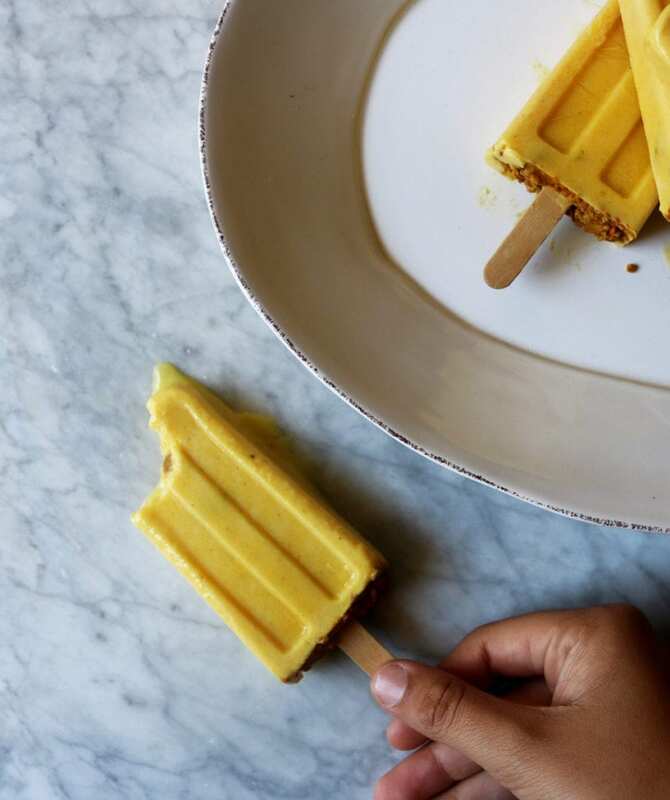 Think of it like a smoothie bowl-meets-popsicle situation. Popsicle Molds. These are the molds that I use and I love them. I also bought these sticks in bulk. 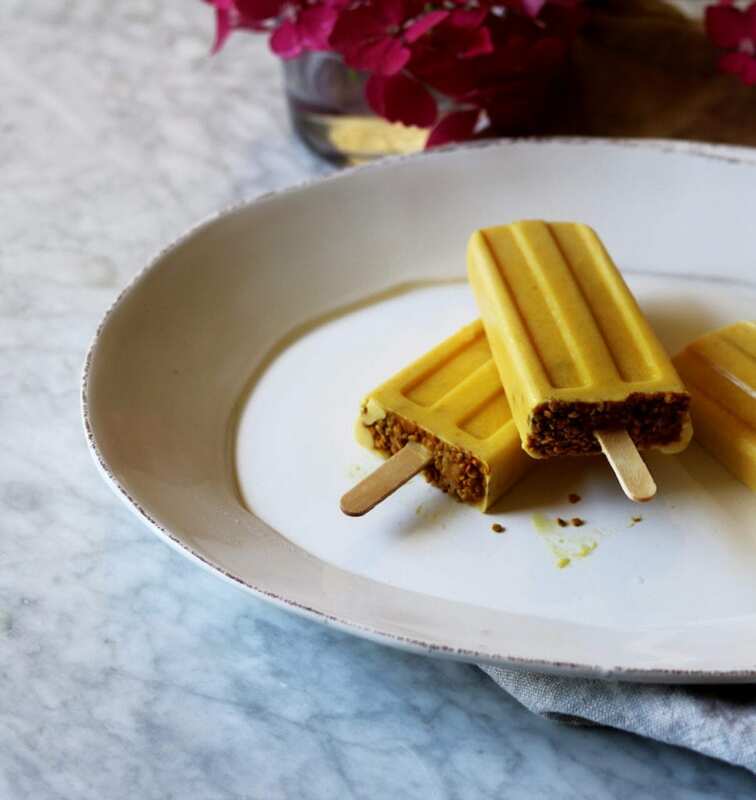 So nary a popsicle craving will go unsatisfied. Ingredients. I like to load these with healthy stuff.. I’m obsessed with collagen peptides. Are you into them? They are loaded with protein, good for your gut, skin, hair + joints and they’re completely tasteless. This is the one I get here. You could sub in your favorite protein powder as well, but that will affect the taste/texture of the popsicles. I also added MCT oil (here is a great post that talks about MCT oil) and bee pollen. Bee pollen, while I love it, can be omitted from the recipe and the MCT oil can be replaced with coconut oil if you’d like. Additionally, if you have pollen allergies, skip the bee pollen as it may cause an allergic reaction in some people. Tips. 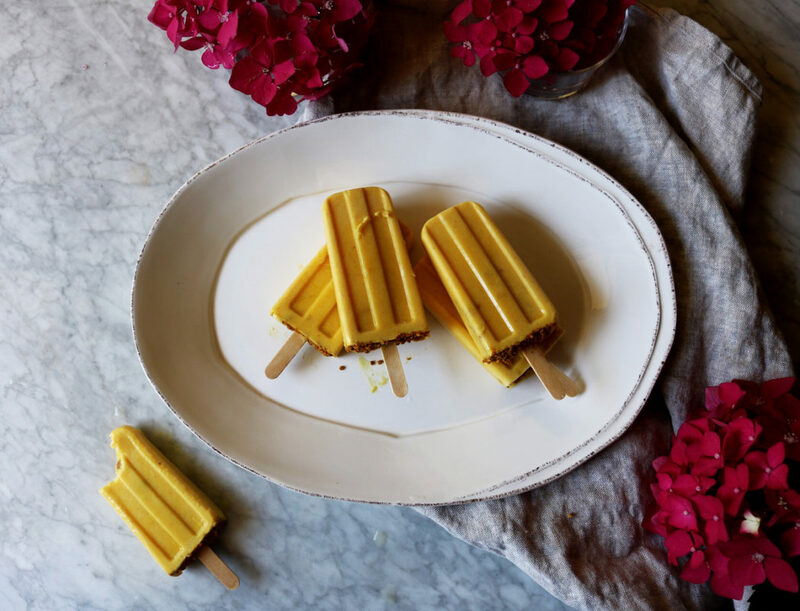 Leave about 1/2 centimeter of space at the top of each popsicle mold…they’ll come out prettiest that way. Getting Popsicles Out. Run the popsicle mold under warm water (taking care to not get the actual popsicles wet) for maybe 20-30 seconds and gently wiggle the popsicles out. If they resist, don’t force them. Simply run them under more water until they release easily. Let’s make some Pious Pops, shall we? In a blender, mix the greek yogurt, banana, tangerines, water, peptides, coconut, MCT oil, turmeric, ginger and cinnamon until smooth and fully incorporated. Taste. You can adjust the flavor at this point by adding more cinnamon, ginger, turmeric or tangerines to taste. Pour the mixture into six popsicle molds. Divide the bee pollen over the top evenly, about 1 tablespoon each. Add your popsicle sticks and freeze for at least four hours. When ready to serve run under warm water (for about 30 seconds) to help the popsicles release from the molds. Thank you for making these Pious Pops! Tag me on social @displacedhousewife #displacedhousewife so I can see your gorgeous popsicles!!! 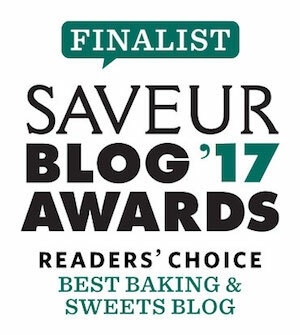 The 2017 Saveur Blog Awards nominations are now open! 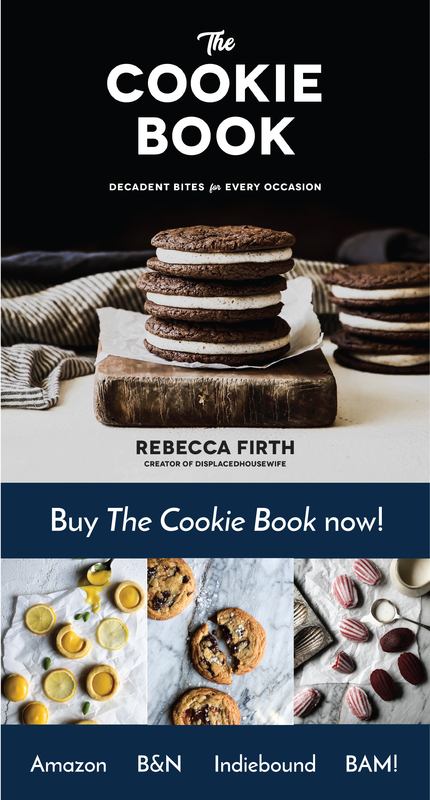 If you like what you see on DisplacedHousewife I would love it if you would nominate me for the Best Baking + Sweets Blog category!! It’s super quick + easy. Thank you thank you thank you! My favorite NY Times article of the year. I knew naps were good for you. 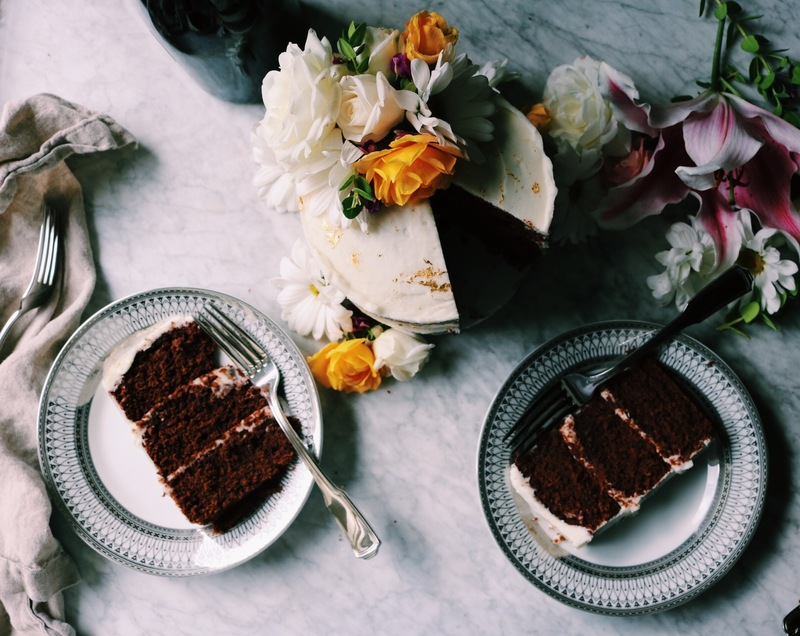 In other exciting news, Adam, Ryan, Christine and I are talking about putting together a retreat…three days of cooking, baking, eating, wine tasting… We want it to be small and intimate, so space will be limited. If you’re interested in more details, send me an email (or comment below) and I’ll put you at the top of the list. More information coming soon! Sending you all lots of love + light!! So refreshing, so good, so nice ! I will be back.Promise ! Oh yes!! So into these girl!! You’ve packed it all in, Rebecca… healthy, yet refreshing and indulgent! I’m just learning about MCT oil and can’t wait to give it a go… coconut oil is already a daily. I just got my first pop molds last summer and just popped it in the freezer yesterday to get into my popsicle making mode! Delicious my dear! Yummmm these look all kinds of delicious! And healthy. Currently making lemon meringue pie pops! Gorgeous as always girl. What a flavor combo too! I have trouble getting those pops out sometimes so I appreciate the notes on that. It takes some patience. 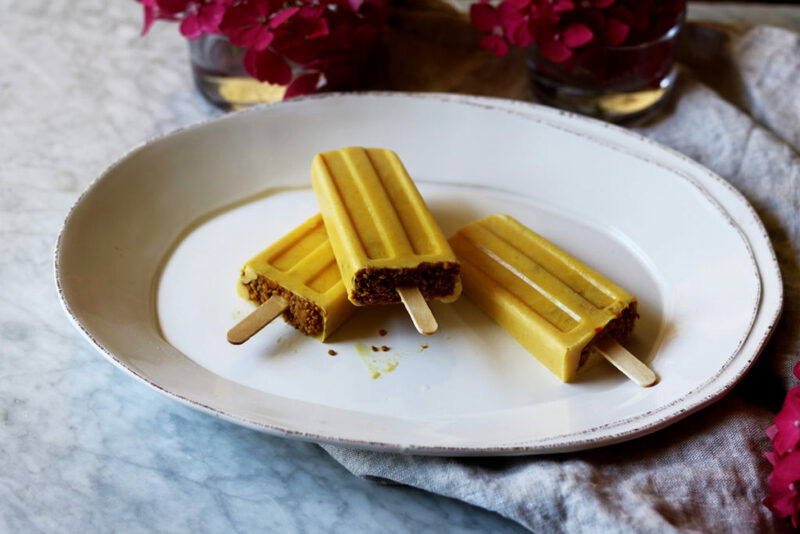 Woohoo to bright and healthy popsicles Rebecca! These sound absolutely dee-lish! I’m not familiar with collagen peptides, but I bet I should be. I’ll look into them asap. I can’t wait to check out all the yummy pops for popsicle week. I’ll be posting one on Thursday! While I love your baked sweets this looks so refreshing and tasty! I love that the pops are healthy but also look delicious. I’ll be trying these soon! These look delicious, I cant wait to try the recipe!! !